"I play my stupid songs, I write these stupid words, And I love every one"
J.S. 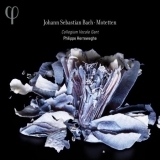 Bach: Motetten (this album) (2011). Sorry, no matches on eBay for "Jesu, Meine Freude, Motet For 5 Voices BWV 227: Trotz Dem Alten Drachen Philippe Herreweghe / Collegium Vocale Gent".